There have been several studies into how effective cannabis might be in treating or even preventing diabetes. However, the results aren’t clear. One 2012 study published in the British Medical Journal (BMJ) found cannabis use reduced the risk of developing diabetes by 58%. A similar – and larger – study published in the Journal of Diabetes Research in 2016 didn’t find any correlation. Still other research found that cannabis can prevent or delay the onset of Type-1 diabetes, according to the Diabetes Council. The key is its anti-inflammatory benefits. Diabetes affects millions of people around the world – and the percentage of people suffering from this chronic disease is growing. However, it is a complicated disease, and its causes are not well known. There are clear correlations when it comes to Type 2 diabetes between the diseases and other chronic conditions such as obesity. Cannabis may prove to be a good treatment, especially indirectly. CannabisMD.com mentions research that has found cannabis may help stabilizing blood sugars, preventing nerve inflammation, lowering blood pressure, opening blood vessels, and improving circulation. There are also claims that cannabinoids might be more effective than current diabetes medications for treating and controlling the disease. CBD can also reduce the amount of insulin needed and reduce insulin resistance – obviously a serious problem for diabetics who have this condition. In general, the anti-inflammatory properties of cannabis can also help the secondary symptoms that lead to more chronic conditions down the road such as heart problems, circulation issues, pain, and diabetes-related eye problems. Phoenix Life Sciences International (PLSI) is an adaptive healthcare solutions company investigating cannabis-based medications. The company is researching a wide array of medications to treat diabetes as well as pain, cancer, GI problems, autoimmune diseases and conditions, neurological disorders, and even sleep disorders. Diabetes research is particularly intriguing from a research standpoint because you can track patients with definitive symptoms over long periods of time. “The opportunity to treat diabetes with cannabis allows us to develop ‘progressive pharma’ solutions. Unlike cancer being treated with CBD with longer cycles, diabetes is the type of disease conducive to consistent testing as blood levels can be tested every day,” said PSLI CEO and founder, Martin Tindall. Research has also found that cannabinoids may be more effective than existing diabetes medication. Cannabis shouldn’t be considered a wonder drug that will prevent, treat, and cure diabetes or other diseases in all cases, according to the linked article below. But it may possibly offer new treatment options that are potentially safer and more cost effect to treat and manage diabetes. 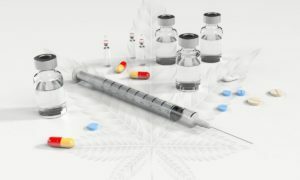 Now that cannabis is legal in Canada, more research is expected to explode here with new and homegrown cannabis-based medications coming onto the market in the future.